Whew! What a busy week this week! Lots of patch orders are keeping us super busy this week. I have had some time to work on some new designs – and maybe teach the process in an upcoming class or video on OMLdigitizing’s site. I absolutely love free standing lace designs – they are amazing to digitize and fun to watch them stitch out. I think the end result is a beautiful piece of work with intricate details and they always look original and interesting – i usually have people ask me about the FSL designs that I have created in the past! FSL is so interesting and are so beautiful. 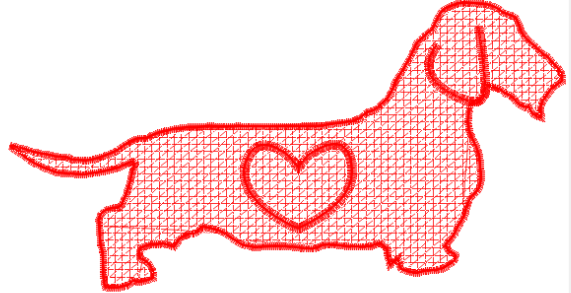 I decided to work on some more dachshund designs, just because I love them so much! We have three weenies at home – Odie – a Wheaton Wire Haired 4 year old guy, Lena-Dee – she is our old girl, now 10 and she is a short hair red weenie (actually she is registered as a wild boar) and of course we have our baby Gallifrey – and he is a short hair black and tan. We have a few short hair designs, but there are very few wire hair or long hair weenies in our collection, so I decided to work with Odie’s silhouette, and create a free standing lace design that shows his beard! I am going to make it into a nice bookmark for my Grandmother! She was able to join us for the Thanksgiving holiday and Mr. Odie got lots of turkey that day! She had a wonderful time feeding Odie treats and getting lots of cuddles, I thought she would like this reminder of Odie and Thanksgiving. It is a work in progress, and I see that I have a few rogue lines to fix up, but all in all i think it is a beautiful design in free standing lace! Sounds like a learning opportunity to me!